Monday and my last day in Chora. Tomorrow I move to a hotel at the other end of the island in Eghiani. I will be sorry to leave. Chora is a comfortable place and I have come to feel comfortable in it. It isn’t that I have made friends here. My inherited genes from both sides predispose me to fall out with people rather than make friends, a tendency I do my best to overcome. Thankfully both Ruth and David have inherited Enfys’s genes and either make friends easily or at least bend over backwards not to fall out with people. But that’s all by-the-by. I have had nothing to do with jeans for years. Give me poly-cotton, high-tech fabrics every time. I’m rambling again. I will be genuinely sorry to leave Chora. I have been here 10 days, done some cracking good walks and enjoyed life in the cheek-by-jowl confined spaces of the old town. On Sunday I planned a walk for today using the bus to get further West on the island and then walk back. When I examined the bus timetable again in the square this morning I realised that the plan was better conceived than I thought. The English language version of the timetable said that the bus to the Western villages ran every day Monday to Friday at 12.00 from the harbour. This morning I read the Greek version which clearly said that it runs every Monday and Friday. So today was my one shot at catching it. There was quite some confusion in the square not only among the thick foreigners like me who couldn’t master Greek and whose telepathic powers were weak but among the locals. The buses have no indication on the front where they are going. And you can’t judge by the time because the timetables run buses close together and they are often late ….. or early. Except one bus which has a display in the front windscreen saying where it is going. But as it permanently says ΧΩΡΑ (Chora) and it goes to lots of other places as well, that can’t be counted on. I tend to hang back and let the locals interrogate the driver, they do it far more effectively and certainly more aggressively than I do. I listen out for the bits I recognise and then check with the driver just to make doubly sure. The second bus which came was the right one and whisked us off towards the West. The road was spectacular to say the least. I’m glad the driver knew what he was doing as at times the front corner (‘front nearside’ or the equivalent in Greek I think is the correct technical expression for that bit of a Greek bus) was either within inches of scraping the rock face on one hairpin bend or overhanging a crash barrier on the edge of a cliff at the next. And then it got really interesting (the word ‘interesting’ here is in the sense that rock climbers use it – brown trouser job) as a few hundred yards from the village where I wanted to get off (again, ‘alight’ or the Greek equivalent thereof I think is the correct technical term), the bus dived off to the left down a road that was so steep and with so many tight hairpin bends I was amazed a bus could get down it. Most people would struggle to drive it in a car let alone a full sized bus. It turned out that it was going to a beach on the other side of the island and most people got off at that point leaving only me a few locals still on the board. 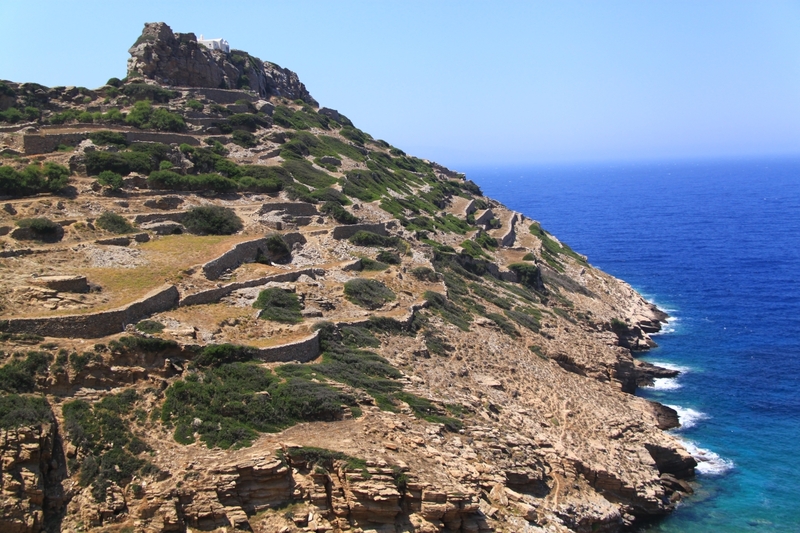 I got off at the appropriate road junction and walked into the village to look for the path to take me to the ancient castle, the Kastri as it is called. For once the SKAI map was quite accurate and helpful, too many times I have found it not to be, and I was soon on a very good path dropping down towards a blue-domed church. 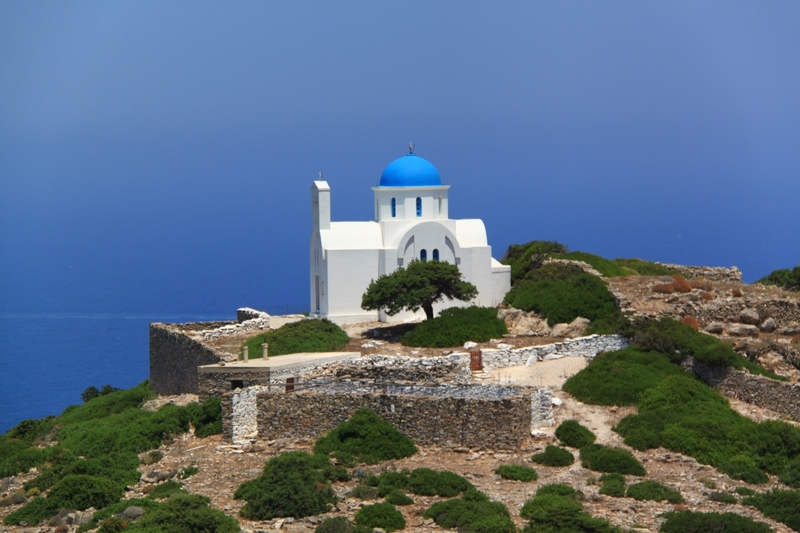 Blue domed churches seem a lot more common on Amorgos than the other islands I have been to, perhaps they are a feature of the Cyclades. They are certainly attractive and this one particularly so outlined against the blue of the sea and the sky. Having reached the church the path, ‘Footpath of Historic and cultural Interest Number 3’ with signs to prove it, continued downwards towards a prominent rocky crag with the remains of the castle on top. Very dramatic. 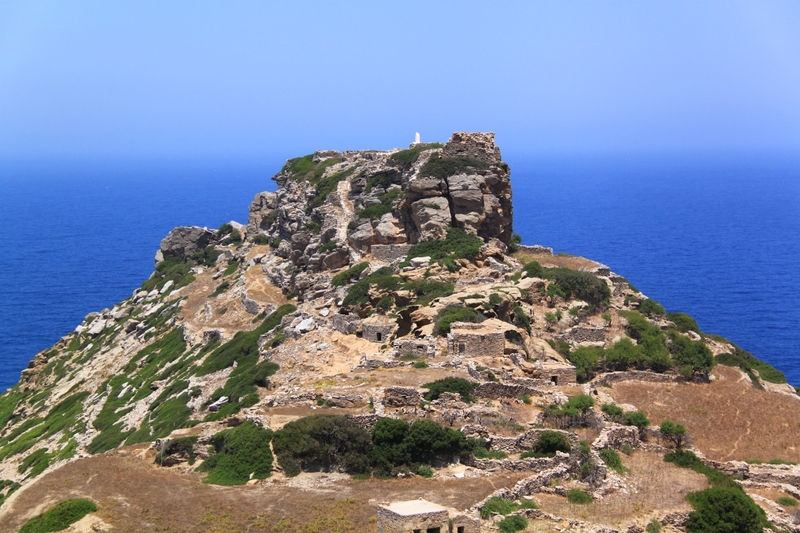 I climbed up the steep stone steps to the top of the crag and into what is left of the castle and the small white painted church perched on the edge of the cliff and spent an hour or so having my dinner and mooching about. There is an air of impregnability about buildings perched on the top of crags, the cliff edges continued vertically upwards by stone walls. Then I went back down the stone steps and followed a footpath around the base of the crag. 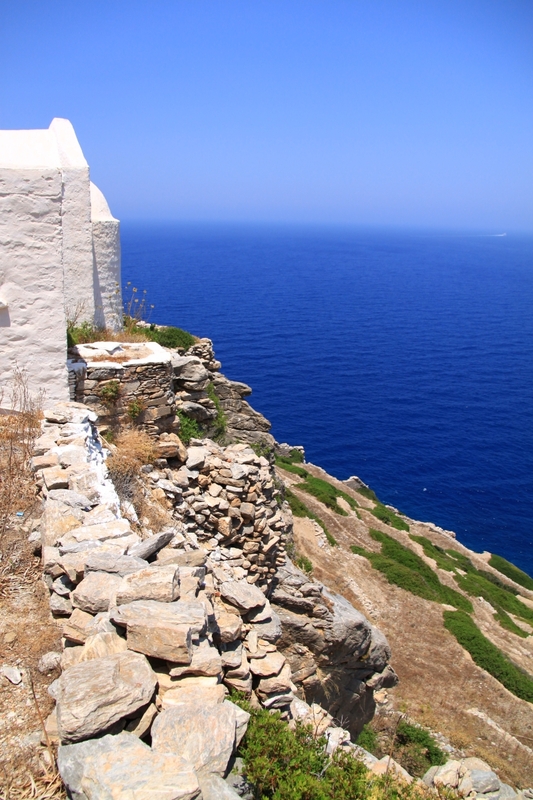 There were small houses built into the rock taking advantage of overhangs and clefts. The path disappeared in places but eventually with a bit if scrambling I completed the circumnavigation and joined up with the onward path back to the town. The guide book is very confusing about the timings for the walk not least because it had a series of 5 options for doing sections of the walk and I couldn’t fit them together. So i had taken the idea from the book and worked it out an option on the map. As it turned out I think I now know what the book was talking about and the timing was pretty good. Two hours back to Katapola from Kastri at a fairly brisk pace. The brisk pace was because my start time was constrained by the bus. I didn’t start walking until 13.00. And my estimate was that the whole walk back to Chora would take about 4 hours plus stopping time for photo opportunities and mooching about. 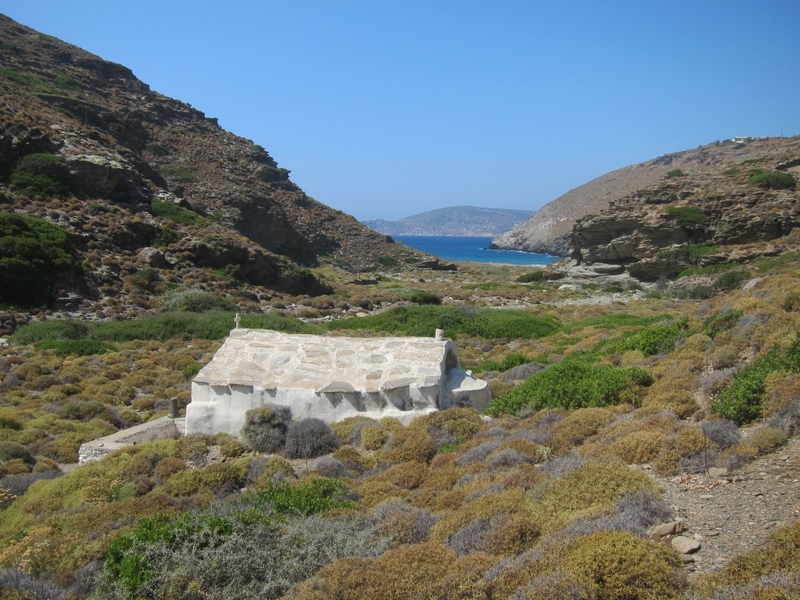 The walk back from the Kastri was different from others in a couple of significant respects. First, the landscape is deeply incised by river valleys and so the kalderimi has to divert inland in order to maintain its height or to drop down to the valley floor and climb out the other side. In one case it dropped right down to sea level. The other respect in which it was different was that there was more evidence of surface water including the occasional trickle of a stream and bridges over them. 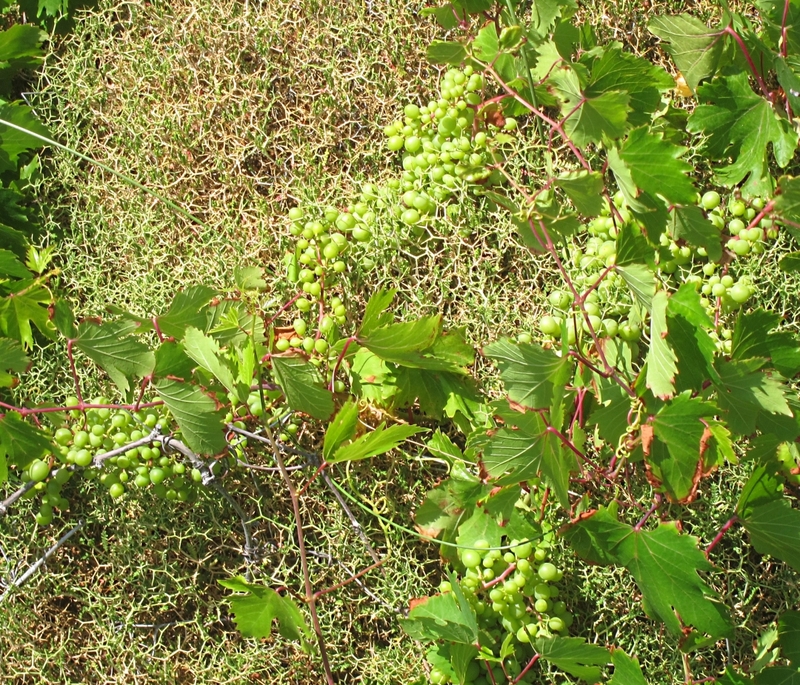 In places the vegetation in the stream beds is very lush, and seems to include in some cases vigorous growth of grapes tangled up with the all sorts of other things. 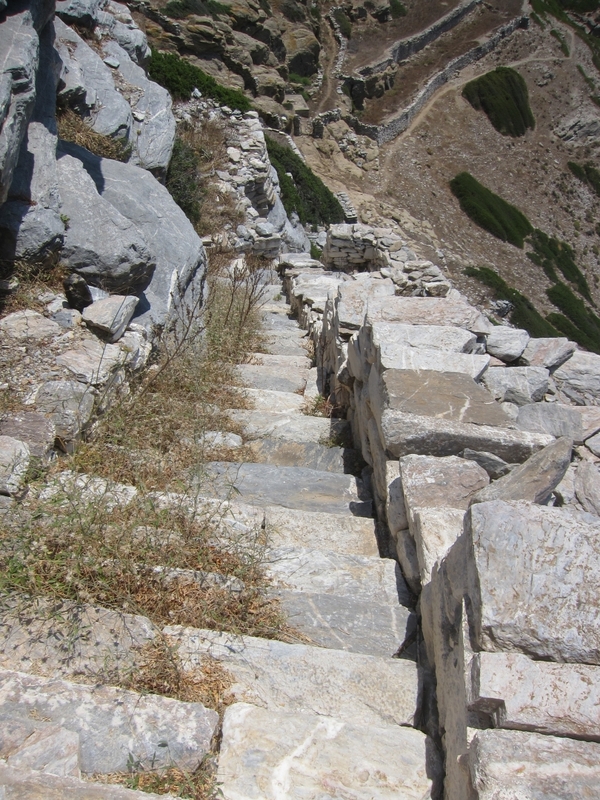 The last section down into Katapola I had done yesterday and from there back to Chora I had done about 3 times so it seemed familiar territory. Strange how a place becomes familiar after only a few days. First time you walk it everything you see is new and you take in a lot of new experiences. After a few times it is still enjoyable but the amount of new stuff you see gets less and less, almost to the point of being an unseen backcloth to the walk. That was particularly so on Monday on the section of path from Katapola to Hora because I was hot and tired. I was watching my feet, too easily snagged by prickly plants trying to attack my feet and ankles, and stepping out because my aim was to get back for 18.00 to fit in the evening’s activities. But, as I’ve banged on about before, the subconscious is constantly monitoring and picks up far more than gets to the front of the mind, dismissing most of it and sending the message to the conscious brain: ‘nothing unusual, normal stuff; don’t pay any attention to that; continue concentrating on walking’. Until, as I was walking past one of the springs alongside the path, I jerked into non-automatic mode as out of the corner of my eye I saw the rear part of a snake on the edge of the opening into a covered tank of water, presumably having a drink. 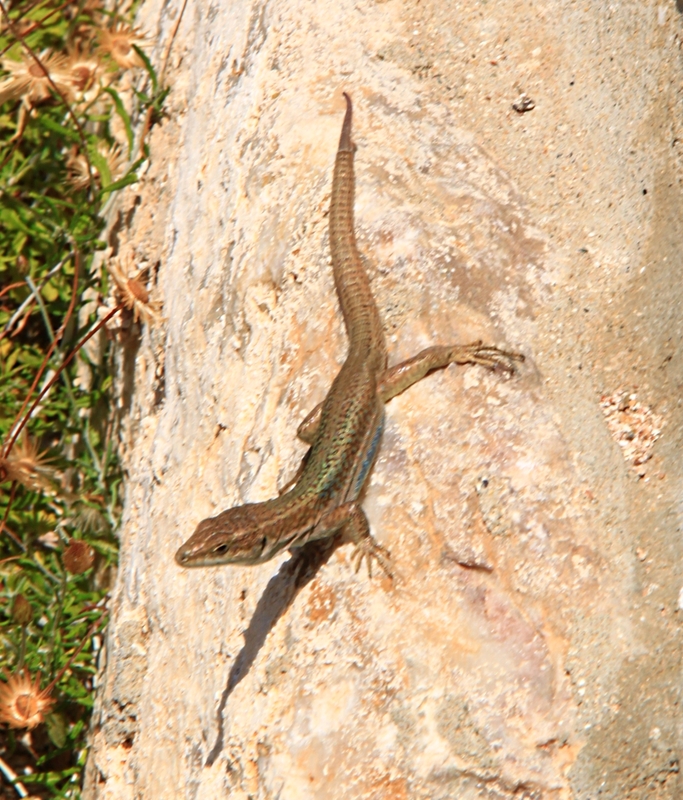 It was a lot smaller than the one I photographed on Nisyros, probably just short of a metre long and less than an inch in diameter. 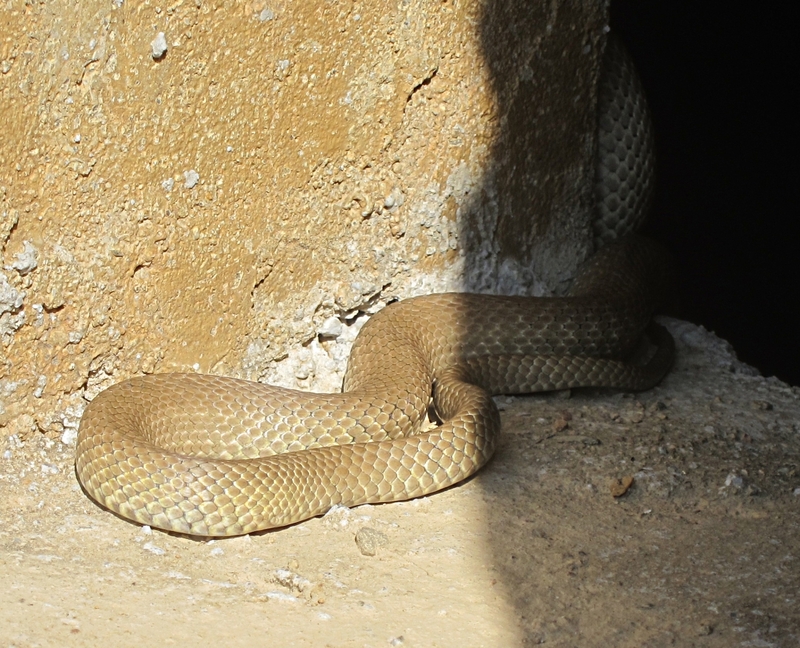 I veered sharply away from it in order to not startle it into slithering off and to dump the rucksack and get the camera out. Because I was so hot and sweaty I had put both camera in the rucksack, invariably I am carrying one or the other for just such an eventuality but not just then. It soon realised I was there and it went mental trying to get away to safety. It found itself trapped between me on the outside of the tank and the water on the inside. It disappeared into the tank for a while but didn’t find that very good, came out again, went in again. I watched it for a good 10 minutes got a few photos before it finally plucked up courage and slithered out of the tank and disappeared into a stone wall. You don’t see too many of those if you only ride around on a hire-bike, which is by far the commonest way of sightseeing and getting to places over here. Great conclusion to the walk. 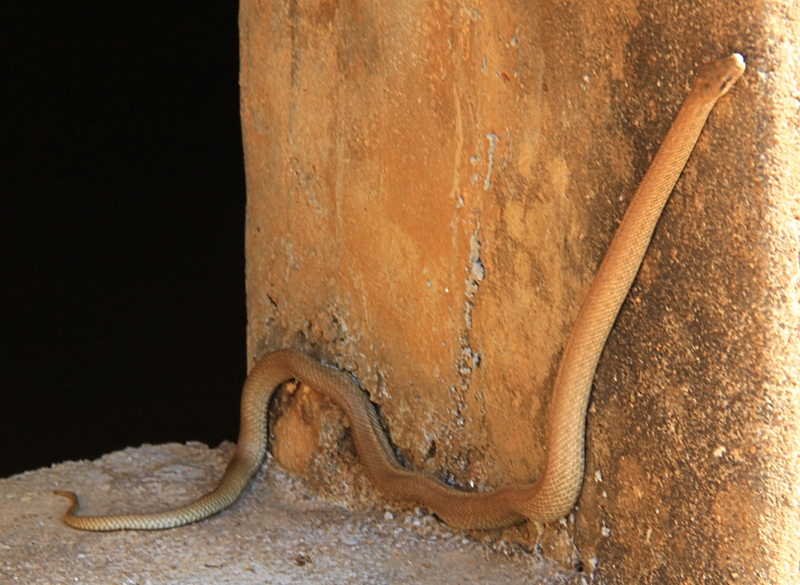 Great snake photos! Couldn’t agree more about the joys of walking compared with the usual hire bike or car. I remember that bus ride! 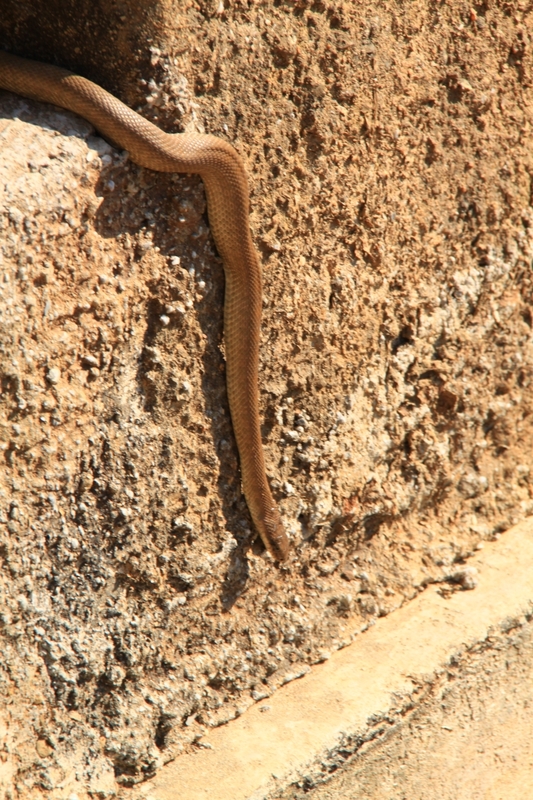 Great snake photos, do you know what type it is? Question; Are there any trees left on the islands? I’ve spotted a few bushes but nothing much taller than a stunted olive tree. Hello Barry! Can you give me an email address? Or please send me an email to info@herpetofauna.gr . I want to contact you via email about the snake you’ve found. Thanks!